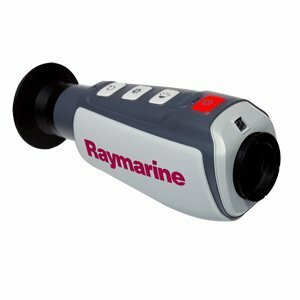 The Raymarine Thermal Marine Scope gives every boater the power to see clearly in total darkness. The Thermal Marine Scope uses the same proven FLIR thermal imaging technology as Raymarine’s premium T-Series fixed mount thermal night vision systems, but they are smaller, portable, and more affordable. The Thermal Marine Scope makes pictures from heat, not light, to help you see landmarks, bridge abutments, and other vessels clearly in all light conditions from daylight to complete darkness. Thermal night vision improves your ability to see rocks, buoys, floating debris, and even helps you find people in the water when just a few minutes can mean the difference between life and death. Long-Life Rechargeable Li-Ion Battery FLIR thermal imaging technology lets you see clearly in total darkness, solar glare, or daylight conditions.